Combining a theoretical background with engineering practice, this book, Design of Steel-Concrete Composite Bridges to Eurocodes covers the conceptual and detailed design of composite bridges in accordance with the Eurocodes. Bridge design is strongly based on prescriptive normative rules regarding loads and their combinations, safety factors, material properties, analysis methods, required verifications, and other issues that are included in the codes. Composite bridges may be designed in accordance with the Eurocodes, which have recently been adopted across the European Union. This book centers on the new design rules incorporated in the EN-versions of the Eurocodes. Design of Steel-Concrete Composite Bridges to Eurocodes addresses the design for a majority of composite bridge superstructures and guides readers through the selection of appropriate structural bridge systems. Design of Steel-Concrete Composite Bridge To Eurocodes by Ioannis Vayas and Aristidis Iliopoulos introduces the loads on bridges and their combinations, proposes software supported analysis models, and outlines the required verifications for sections and members at ultimate and serviceability limit states, including fatigue and plate buckling, as well as seismic design of the deck and the bearings. It presents the main types of common composite bridges, discusses structural forms and systems, and describes preliminary design aids and erection methods. It provides information on railway bridges, but through the design examples makes road bridges the focal point. 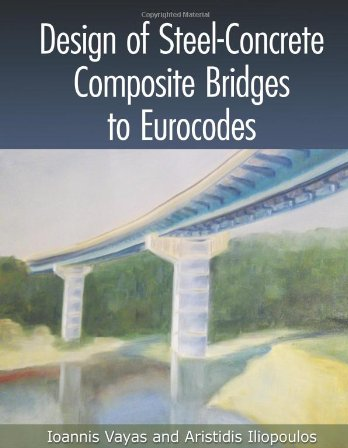 This book, Design of Steel-Concrete Composite Bridges to Eurocodes includes several design examples within the chapters, explores the structural details, summarizes the relevant design codes, discusses durability issues, presents the properties for structural materials, concentrates on modeling for global analysis, and lays down the rules for the shear connection. The author Ioannis Vayas and Aristidis Iliopoulos presents in this book, fatigue analysis and design, fatigue load models, detail categories, and fatigue verifications for structural steel, reinforcement, concrete, and shear connectors. It also covers structural bearings and dampers, with an emphasis on reinforced elastomeric bearings. The book is appropriate for structural engineering students, bridge designers or practicing engineers converting from other codes to Eurocodes.